When I was surfing in the cold ocean in Australia, a surf van came around with all the gear we needed including wetsuits. I thought that was brilliant! Why? Because, while we cannot control the ocean temperature, we can control what we do about it by what we put on our bodies. That got me thinking about how, from time to time, a pool we teach in experiences temperature drops (due to heater issues, the recoup filling up of a pool with cold water, etc.) and we can’t control the temperature of the water. We can, however, figure out how to dress for comfort in the cold – a skill I’d like to think we Canadians are especially good at! When my youngest son, Tate, was small he was very slim and every time we brought him and his twin sister to the condo pool in Florida, which hovered around the 74°F mark, he and his sister would play non-stop! Usually, about ten minutes in I would see that Tate’s lips had turned a deep shade of purple and he was starting to shiver. I’d ask him if he wanted to come out and warm up and of course he would say “No!” I would eventually have to drag him kicking and screaming out of the pool to take a break and warm up for a minute or two. Then we discovered a kid’s shortie wetsuit. The wetsuit tripled the amount of time Tate could stay in the water before he got cold! When your little one is so cold that they are shaking and their lips are turning blue it makes it hard for them to relax enough to take in the skills we are teaching them. Well, now there is something we can do about that! 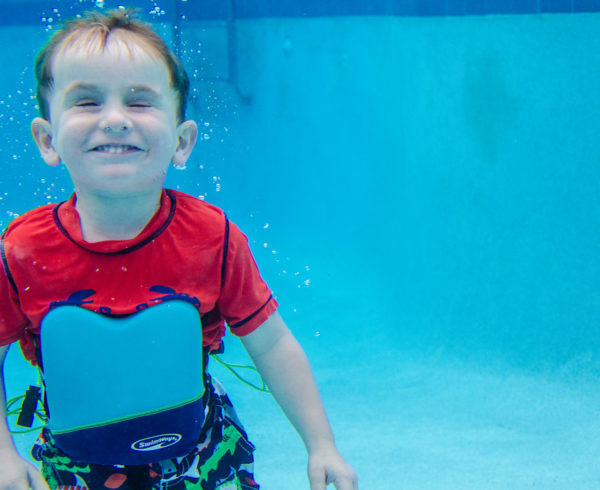 A wetsuit might be just what your child needs. A wetsuit will not keep your child dry but it will help them stay warm. That may sound backwards but here is how it works: a thin layer of water is trapped between the suit and the skin which is warmed by their body heat. This keeps their core warm while children are going through their lessons! The body loses heat quicker through the head and neck, sides of the chest and the groin area. A wetsuit will insulate most of these areas which reduces heat loss making a more comfortable swim. Wetsuits are made of synthetic, rubbery materials with a lot of stretch. There are different percentages and thicknesses of those materials for varying degrees of warmth in different parts of the body. The thicker the suit, the warmer it is. 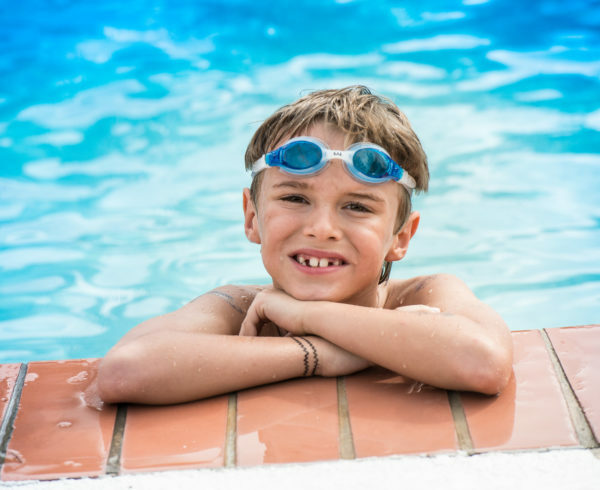 There are many kinds of wetsuits but the best option for your little swimmer is what we in Canada call the shortie or a spring suit which has short sleeves and short legs. 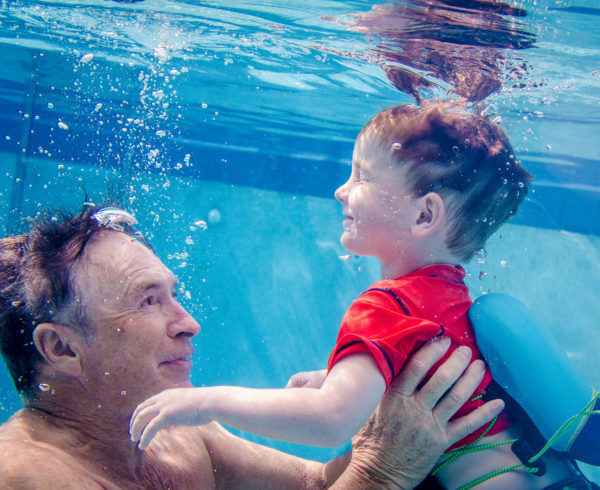 It gives them more mobility for swimming and can be used in a variety of water activities. After all, we are Canadian and we know how to adjust to the cold. We just have not taken that idea into the pool yet! We control the layers when we go skiing or skating – why not do the same for swimming? The wetsuit is a workaround to the problem of a colder pool so there is more enjoyment and learning for everyone! So now that you know the basics about wetsuits, I hope it encourages you to check one out if your child is a purple-lip-shiverer like my son was!